Note: You may use mint leaves for garnish instead of the sugar and limes. Choose the largest strawberries that you can find. Wash and dry them. Cut the bottom part of the strawberries so that they can stand upright. 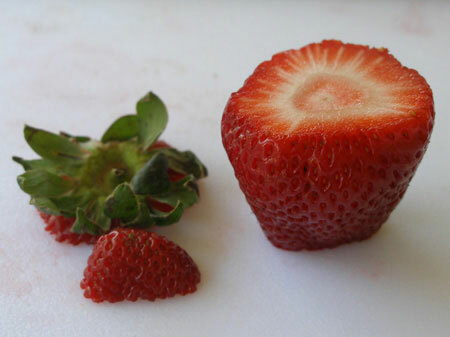 Then, cut the top part of the strawberries. 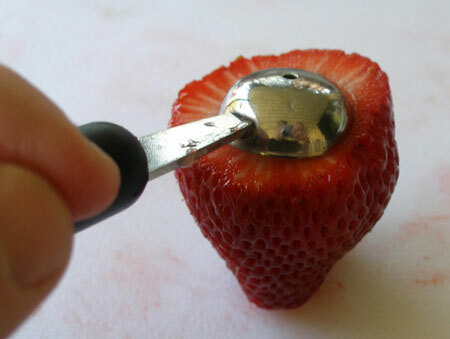 Using a melon baller, scoop the inside of the strawberries very carefully without punching any holes or breaking the strawberries. Boil 6 ounces of margarita mix. 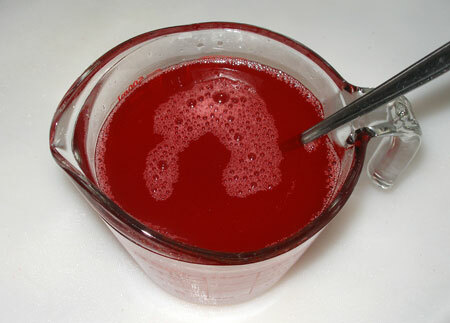 Place the strawberry Jell-O in a bowl and add the boiling margarita mix. Stir well until the gelatin dissolves completely. Add the tequila, tripe sec or Grand Marnier and stir. 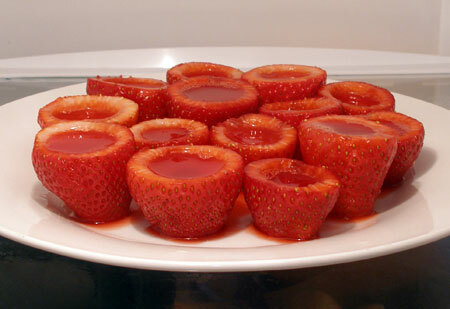 Place the strawberries on a plate and fill them with the strawberry margarita gelatin. Put the plate in the refrigerator. Refrigerate for at least four hours or until firm. Leave any remaining strawberry margarita gelatin outside the refrigerator. You might need it to refill some strawberries that leak. Note: Some strawberries will leak. Just wait until the initial gelatin sets and then refill the strawberries with more gelatin. Any spilled gelatin on the plate can be scooped with a spoon. 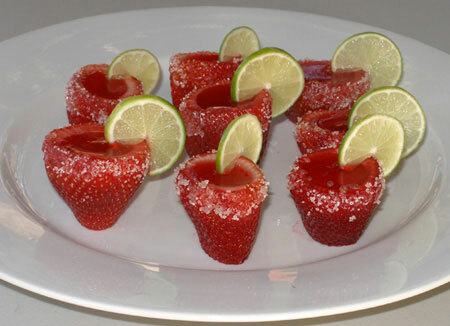 Rub the rim of the strawberries with a lime wedge. Dip and rotate them in sugar, not salt, to coat the rim. Garnish with key lime wheels. Note: If you don't have key limes, you may use regular limes. Cut the lime wheels into small triangle limes. 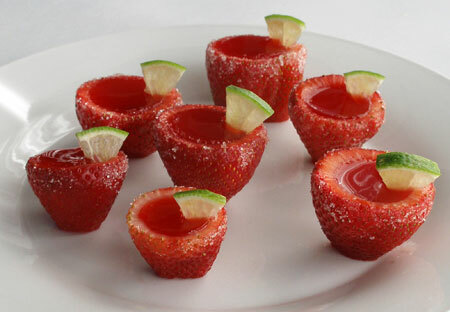 Follow the same instructions as the strawberry margarita jello shots recipe. 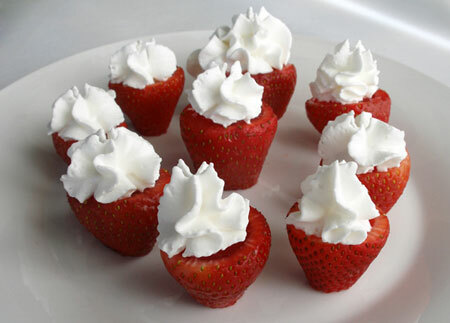 Garnish the strawberry daiquiri jello shots with whipped cream. If you have mint leaves, you may use them too. 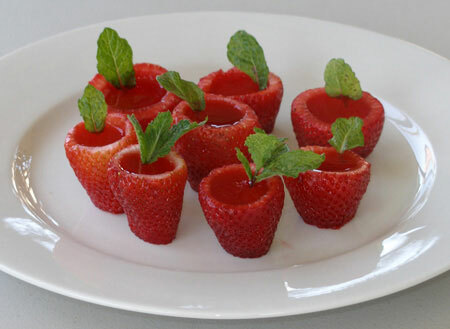 Note: There are a few ways that you can garnish the strawberries. 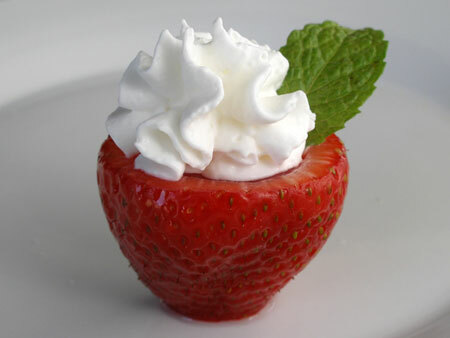 You may use mint leaves, whipped cream or both.